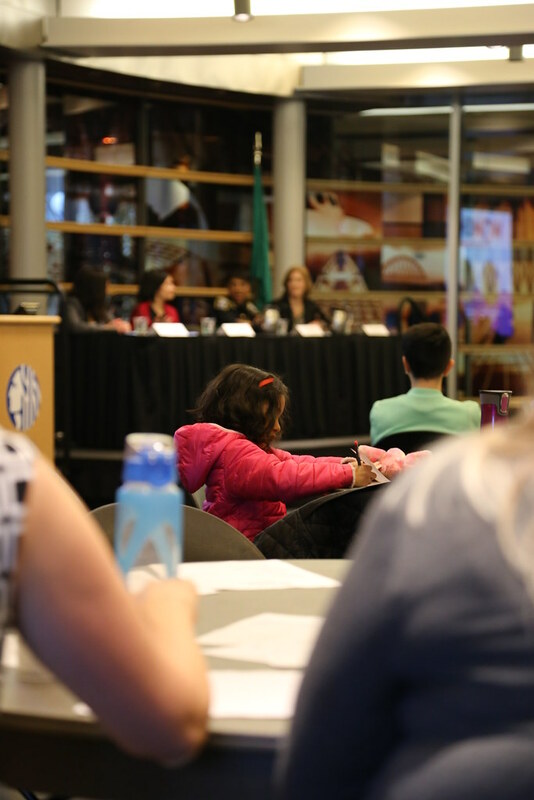 On Thursday, more than 240 members of the City of Seattle community attended the Women in Power: Press for Progress event. This event celebrated International Women’s Day and powerful women everywhere. The event took place in the Bertha Knight Landes Room, named after Seattle’s first female mayor. Opening speaker Mayor Jenny Durkan, the second female mayor more than 90 years later, recognized the significance of the space and the moment. The morning panel discussion event included women from across the City of Seattle including: Deputy Mayor Shefali Ranganathan, Interim Chief of Police Carmen Best, and Acting Director Seattle IT Tracye Cantrell. The discussion, moderated by City Light Director Michelle Vargo, surrounded the importance of mentorship and encouraged the audience to amplify one another throughout their work. Each panelist contributed their unique perspective from their experiences and departments. The afternoon panel, moderated by City Light Director Maura Brueger, featured four of Seattle’s six female city councilmembers: Lorena González, Lisa Herbold, Debora Juarez and Teresa Mosqueda. The panelists focused on the importance of being heard and becoming agents of change within their spaces. City Light’s Sarah Davis, who founded and chairs the volunteer Women in Power group, was thrilled with the event and is excited to see where the conversation goes from here. A special thank you to the committee who made this event a reality: Sarah Davis, Stefanie Johnson, Koryn Kennedy, Holly Krejci, Courtney Adams, Kathryn Mork, Bianca Smith, Uzma Siddiqi, Martha Hobson, Stefanie Guzman and Dana Robinson-Slote. More than 200 viewers watched the event via Skype. Click here to watch the event in its entirety. Created in late 2016, Women in Power (WIP) is a City Light employee-run group whose mission is to foster professional development, better support one another, and address unique issues women face in the workplace. In addition to bi-monthly programming and the International Women’s Day event, WIP recently launched a 6-month pilot mentoring program. WIP is open to all City Light employees (both women and men).